INVISIBLE-EXPORTS is pleased to present Scott Treleaven’s fourth solo exhibition at the gallery. Consisting of a painted frieze punctuated with photo collages, the show is an apt evolution of Treleaven’s core methods and criteria; the material application of splicing, montage, and collage as analogies for perception. An unframed, multi-paneled frieze hangs below the ceiling line like an unspooled film revealing an inventory of circular geometries; painted in hues from pastel to vibrant, their forms chart a rhythm across planes of black squares, themselves in motion. Beneath the horizon of the frieze is a small array of distinct and complementary photo collages; bipartite constructions made from two decades worth of the artist’s 35mm snapshots. 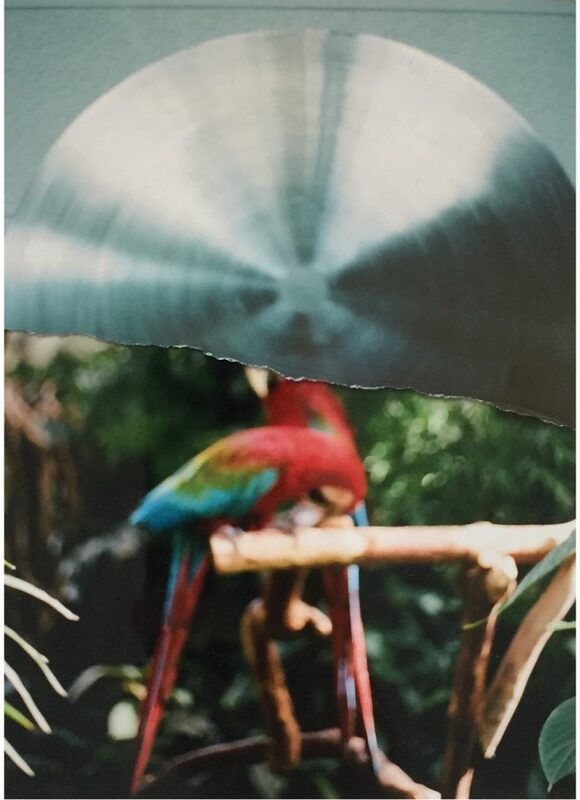 Usually depictions of atmospheric effects in nature, or the quotidian setting of the studio, their fulcrum rests on an actual physical rip in the photographic print. Like the segmented spatial ecology of the frieze, the harmony in the assemblages reassert Treleaven’s position as a deft collagist. The assemblages avoid easy visual or surrealist puns, playing instead with arrangements of subject, light, color, and space. Each photo surrenders up a fraction of its original, autonomous life, now a segment in a new narrative that evokes the information missing in their discarded halves. Treleaven’s artistic origins are in small-gage filmmaking and self-published zines that made an enduring contribution to independent, queer, and underground culture. Over the years, through a series of decisive shifts in medium and intent, he turned to painting and drawing, embracing the phenomenological and spiritual legacy of abstraction as a transcendental, rather than purely formal, tradition. The modest and democratic tenants of his early practice continue in his material choices, as well as the theory of collage as a basic gesture of insolence, a social strategy for discord and for metaphysical beauty. Scott Treleaven (1972, Canada). Group exhibitions include Language of the Birds, 80WSE, New York (2016); Outside the Lines, Contemporary Arts Museum Huston (2014); White Petals Surround Your Yellow Heart, ICA Philadelphia (2013); Dark Cube, Palais de Tokyo, Paris (2012); and In Numbers, ICA London (2012). Solo exhibitions include: INVISIBLE-EXPORTS, New York; COOPER COLE, Toronto; Marc Selwyn, LA; and John Connelly, NY.